It's only natural that you want the air you breathe to be clean and clear--and cabin air filters are a great way to do that. Here at Hanson Kia, serving Hawks Prairie and Lakewood, we're proud to offer genuine Kia cabin air filters! These filters make sure that dust, pollen, bugs, and other contaminants don't enter your vehicle; however, over time, these filters get clogged, so your HVAC system has to work harder. 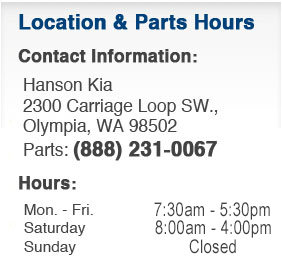 Genuine Kia air filters are well worth a drive from Tacoma or Puyallup, so be sure to stop by Hanson Kia so you can breathe easy once again.